Note 1: North America used a separate switch and warning light, and white/black wires from fuse to switch and switch to screen, from 1968. 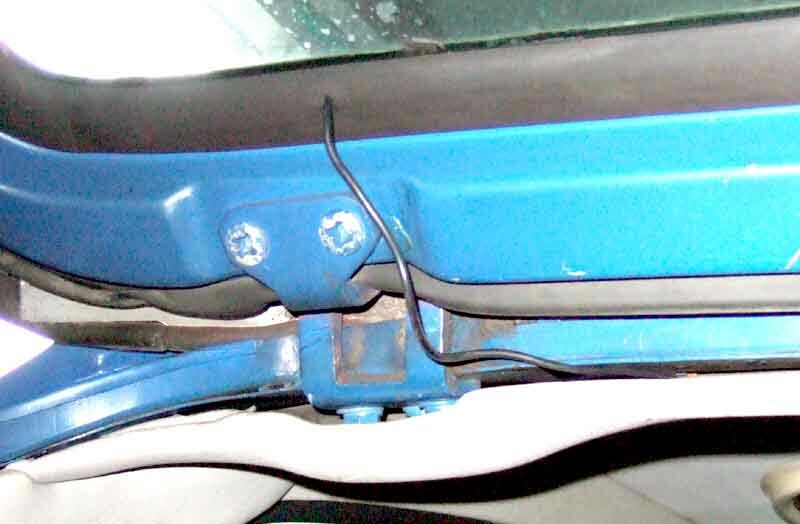 Note 2: The 12v circuit from the switch has bullet connections where the main harness joins the rear harness in the engine compartment; by the right rear light cluster where a single wire goes up the C-pillar; and where that wire connects to the wire coming out of the screen rubber by the right-hand hinge. Note 3: The earth circuit uses a single black wire down from the bullet connector by the left-hand hinge, to the top mounting point for the left rear light cluster. Note 1: Pull-switch with integral warning light used from 1973 in North America. 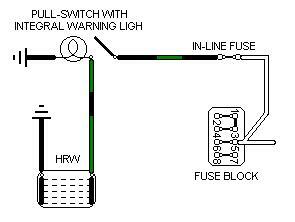 Note 2: In some diagrams the wire to the external warning light is shown as red with a brown stripe. 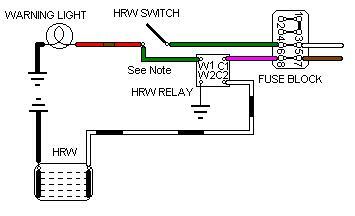 Note 1: Green from the output of the switch to the relay is logically incorrect. This colour is normally used for fused ignition i.e. 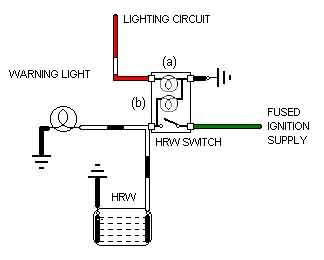 is live all the time with the ignition on which would operate the relay all the time. It also means that two different colours are on the same terminal which normally never happens - the other being red/brown to the warning light. Strictly speaking red/brown should have been used as the colour feeding the relay as well as the warning light. Note 2: The 12v and earth connections are the same as for the chrome bumper, see Notes 2 and 3 here. Note 1: The switch was illuminated with the parking lights on and hence has additional red/white and earth wires. 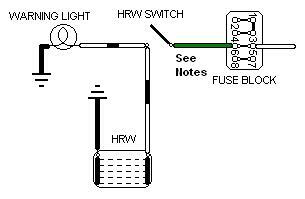 Note 2: From some time in 1978 the HRW (GTs in RHD only by this time) was powered from a subdivision of the green circuit fed by a separate in-line fuse under the fusebox. One of two connecting a white/brown to a green, it is the one with the thinner wires, the other one with thicker wires is for the cooling fan. See ignition schematics for more info. Note 3: Clausager says that 1977 models up to December 77 had the heated rear window switch with built-in warning lamp, even though there was space beside the switch for the warning lamp. From December 77 to the start of the 1980 model year there was a separate warning lamp, however 77 to 79 diagrams only show the separate warning lamp. 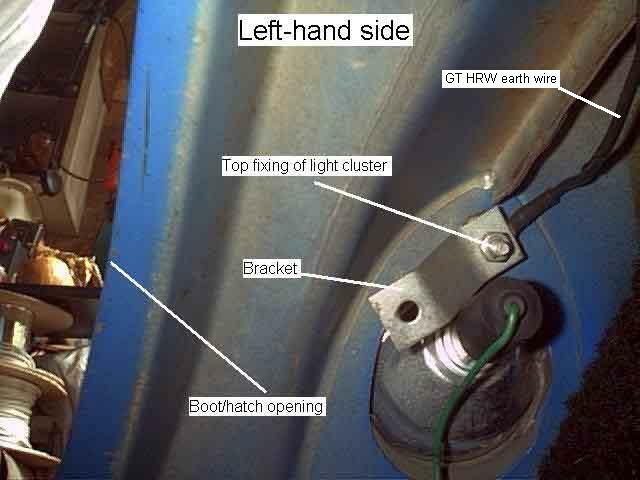 When the fog-guard switch was added in 1980 the space for the HRW warning lamp was lost and a switch with internal tell-tale was provided again. Also see comments on the rear fog-guard switch illumination. 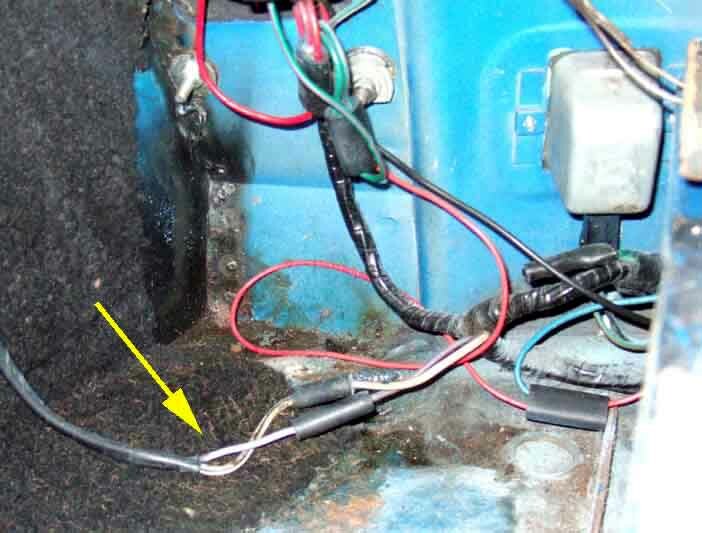 Note 4: As well as the 12v and earth connections listed in Notes 2 and 3 above, 1977 and later cars have the white/black output wire going via a bullet connection (left unused on roadsters) and multi-plug behind the dash where the main harness joins the dash harness. 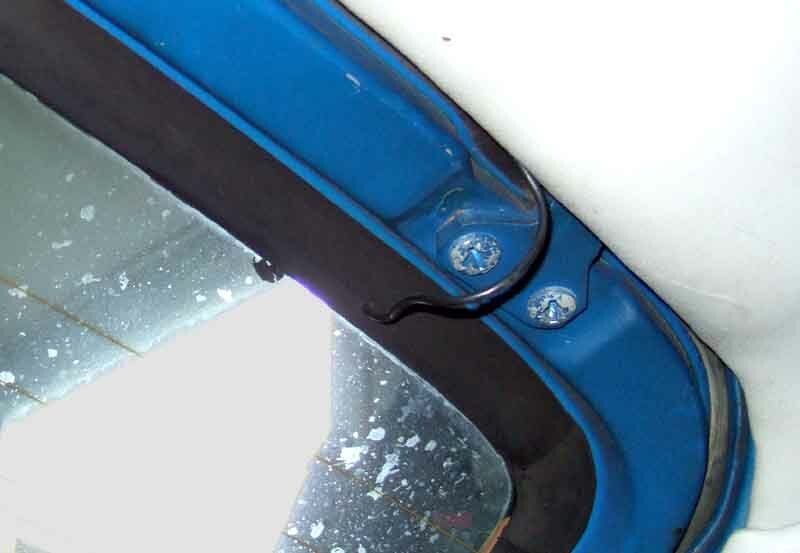 Physical wiring Hatch open, wire exiting from the window seal rubber and going to a bullet connector above the rear header rail of the headlining. 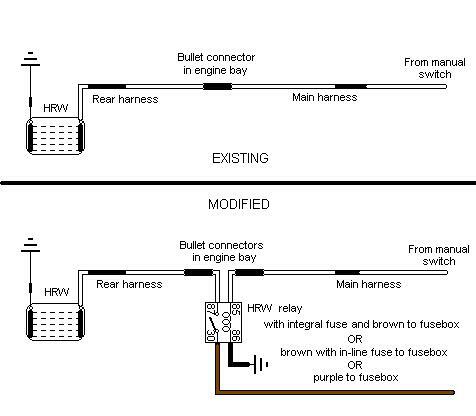 The two 12v feeds going up the right-hand C-post for the HRW (white/black) and the load-space light (purple). 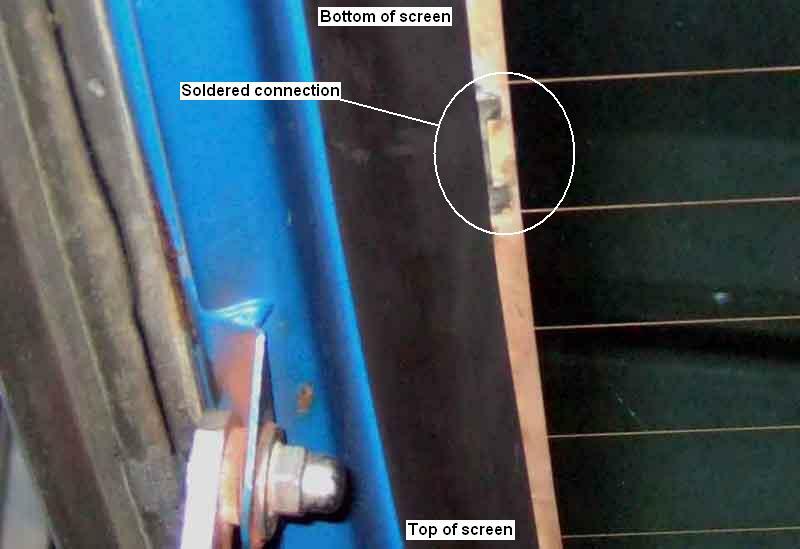 The soldered connection point on the surface-printed element, about mid-way down the side of the glass, in this case the left, hatch open on my 75 V8, with the connections and wiring completely covered by the rubber seal. 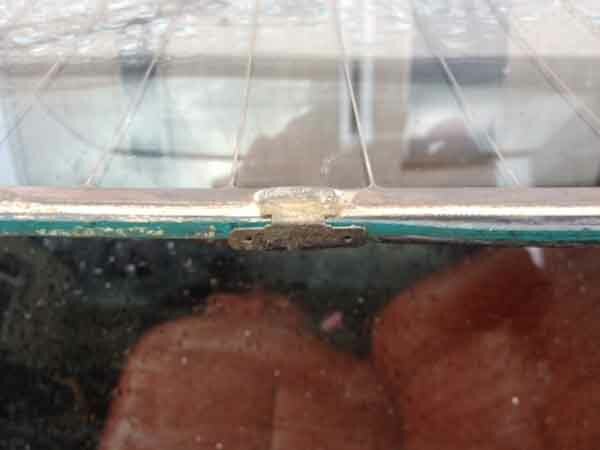 Robert Kerr's car, glass removed, showing the two spades on the inner edge of the glass. I'd say extreme care needs to be taken if you need to disconnect/reconnect the wire attached to this connector, say when replacing the glass, to avoid the risk of detaching the connector from the screen. 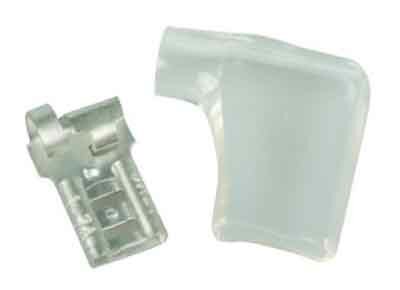 Roy Marshall's replacement glass, showing the very inconvenient connection arrangements. 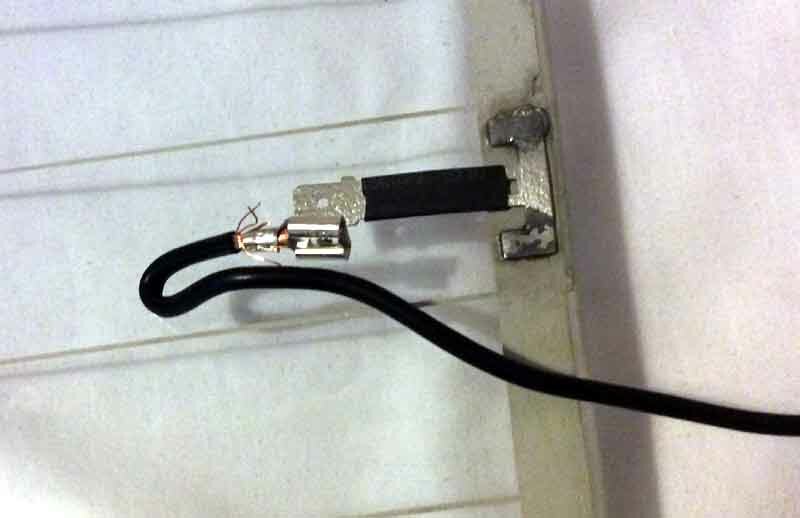 I suggest a right-angle wiring connector is the best way to get a half-way neat installation, however check the size of the spade on your glass first.